As monitors age, luminance and color temperature are apt to change. 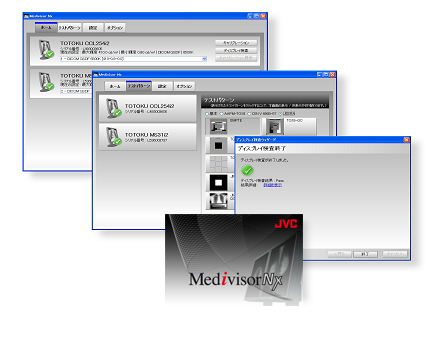 JVCKENWOOD's Medivisor Nx will keep your monitors performing to DICOM standards. Medivisor is included in the calibration kits, along with photo sensor or "puck" for luminance testing and adjustment. The new automatic display detection analyzes display configuration without any wizards or manual inputs. The automatic sensor detection checks for connected and available calibration sensors and selects the right one automatically. Simple user interface makes it easy for you to calibrate the display with just two clicks, no setup or settings necessary. Also one of the new key features is the new tray icon. It shows real-time status of the displays in the Windows task tray. This ensures diagnostic confidence and constant image quality without touching the display. It goes without saying that maintaining grayscale accuracy is of significant importance for monochrome medical image displays. Periodic calibration by Medivisor Nx provides accuracy control that conforms to the Grayscale Standard Display Function (GSDF) according to DICOM Part 14. Calibration history is saved separately for each monitor and instant access is provided to previous calibration records. Attaching a calibration sensor, luminance,gamma, and color temperature (for colormodels only) can be simply but accurately calibrated. All that's required is to follow Medivisor Nx's instructions. In addition, a built-in front sensor provided with i2 models enables even simpler calibration without attaching the calibration sensor. *Color temperature calibration by the front sensor is available only for limited models. *Periodic calibration of the front sensor is recommended. It can be performed automatically by calibration using a calibration sensor. Various test patterns are included with QA Medivisor, for simple visual examination of monitor characteristics. QA Medivisor can be used to perform acceptance and constancy tests according to various standards.